Search Results for "whale shark"
Majestic whale shark swims slowly by camera; close up on remora fish and texture of whale shark. 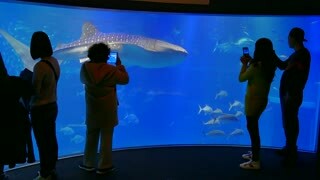 Majestic whale shark slowly swims in open tropical water; covered in remora fish; silhouette. 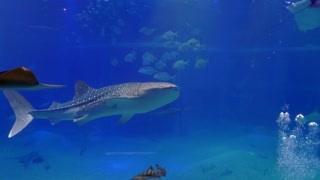 Whale Shark Swimming in the Waters of the Caribbean Sea The whale shark is a slow-moving, filter-feeding carpet shark and the largest known extant fish species. Exuberant tropical animal species. Awesome unique wildlife from around the World. Aerial view of tourists swimming with whale sharks, Oslob, Philippines. Whaleshark wide shot in shallow water getting closer towards end of shot. Diver camera operator making a video of the whale shark in ocean Galapagos. Amazing life of tropical nature world in blue water. Scuba diving and dangerous extreme tourism. Whale shark giant size underwater in search of food on seabed Maldives. Unique amazing video footage. Abyssal relax diving. 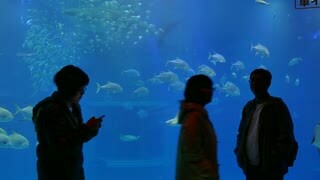 Natural aquarium of sea and ocean. Beautiful big spotted animals.